Now that audiences, fans, and critics have begun comparing the merits of Seattle Opera’s two La traviata casts, it’s time to compare two great—-although radically different—-approaches to the scene at the opera’s core. I’m talking about Violetta’s double-aria that closes Act One; but about neither the slow, hesitant first movement, “Ah, fors’è lui”, nor the wild second movement, “Sempre libera”. For me, the core of the opera is the recitative connecting those two passages, because in this recit you can hear Verdi, in 1853, inventing a new kind of opera. By which I mean, the concerted pieces themselves are beautiful music, but dramatically they are static snapshots of emotion. The character is more alive, changing and, what’s most important, THINKING, during the recitative. Before Verdi, the composer’s goal was to get through the recitative as quickly as possible, since all anybody cared about was the singing, the expression of emotion. 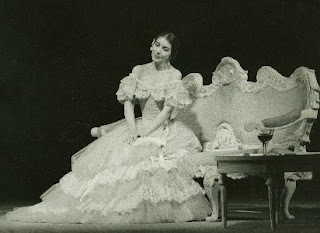 But Verdi was a dramatist, who found human character, thoughts and choices, just as interesting as expression of emotion. And so it’s in passages like this—-great Verdi recitatives—-that you really find out who a performer is. 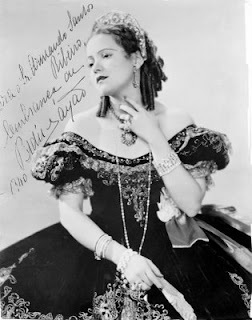 Compare how the Brazilian soprano Bidú Sayão (1902-1999), right, and Greek soprano Maria Callas (1923-1977), below, end the contemplative first movement and then sing this recitative, in which Violetta rejects the dangerous possibility of true love in order to rededicate herself to the wild party-girl lifestyle which, she knows perfectly well, is going to be the death of her. What more do I have to hope for now? And in whirlwinds of sensual pleasure, die. We’ve compared these two recordings at lots of recent Seattle Opera education events, and I’ve been gratified by how many people immediately hear the difference, which I would go so far as to call the difference between bel canto and music drama: a performance in which the singer’s technical skill is front and center, and a performance in which the grotesque mental state of the character is front and center. Great examples to make the point, Jonathan! I like your discussion of the importance of this recitative, too.